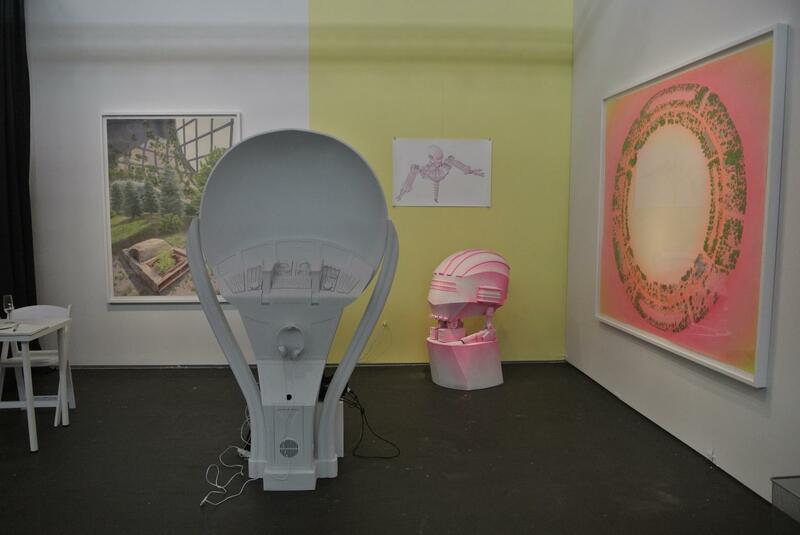 Ocular EVA Pod (detail), 2015. 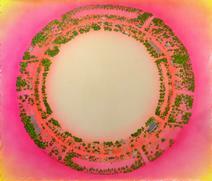 PLA polymer, spray paint, and archival MSA varnish, 72 x 30 x 48 in. Centralia Habitat, 2014. Acrylic on muslin, 60 x 75 in. Centralia Habitat: Circle, 2014. Acrylic on muslin, 68 x 74 in. Warhead, 2014. 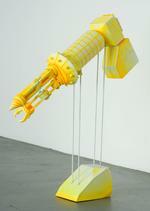 PLA polymer and acrylic, 45 x 24 x 30 in. Mining Arm, 2014. PLA polymer and acrylic, 50 x 54 x 12 in. Arm Study: Gradient, 2015. Archival pigment print and watercolor on paper, 24 x 13 in. Robot Study in Chartreuse, 2015. 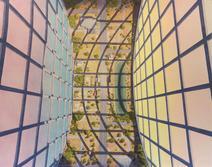 Archival pigment print and waterclor on paper, 24 x 51 in. 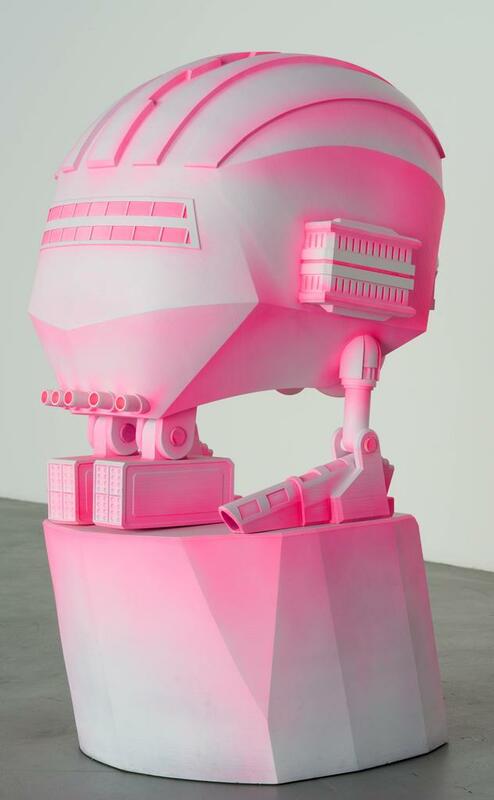 Robot Study in Pink, 2015. Archival pigment print and watercolor on paper, 24 x 36 in. 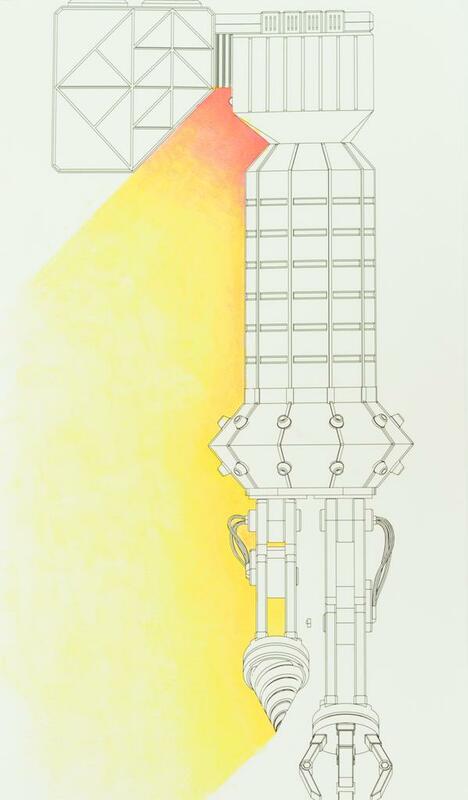 Warhead Study: Sunrise, 2015. Archivial pigment print and watercolor on paper, 24 1/4 x 24 in. Warhead Study: Slices, 2015. Archival pigment print and watercolor on paper, 13 1/4 x 24 in. 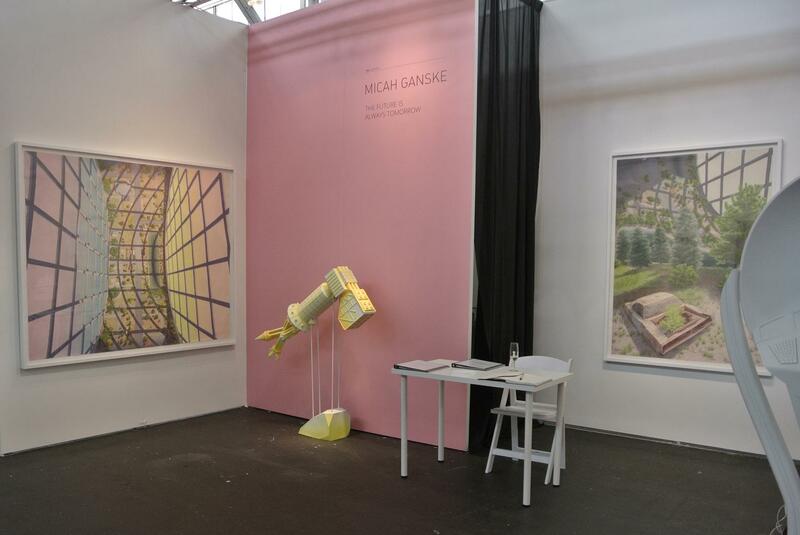 101/EXHIBIT is pleased to present a solo presentation of Micah Ganske's latest work at Art Market San Francisco 2015, Booth 109. 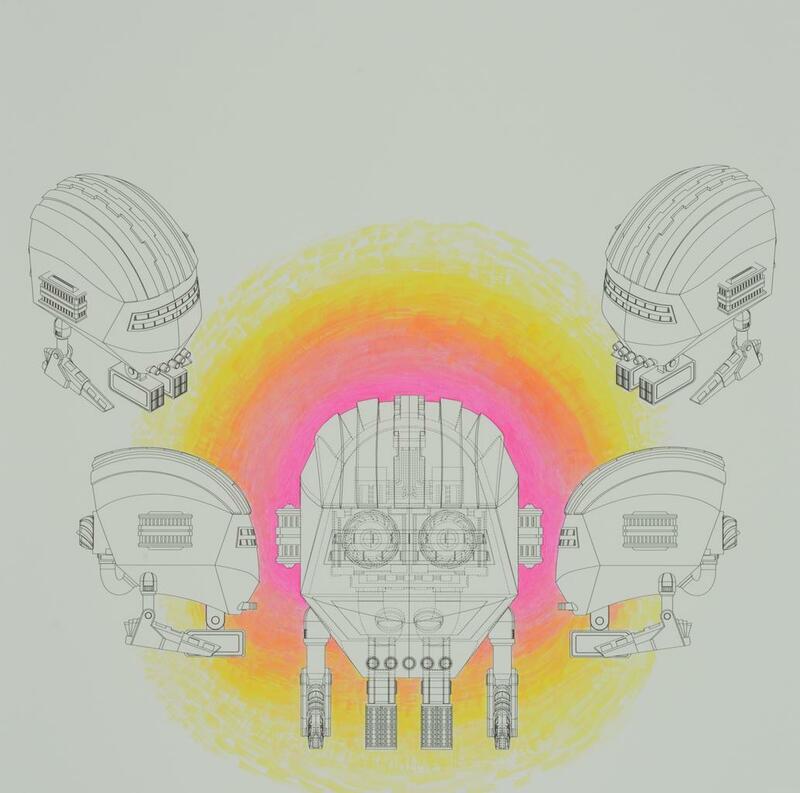 In this latest body of work, a continuation of his most recent solo exhibition The Future is Always Tomorrow, Ganske envisions a possible future form of human society and habitation. 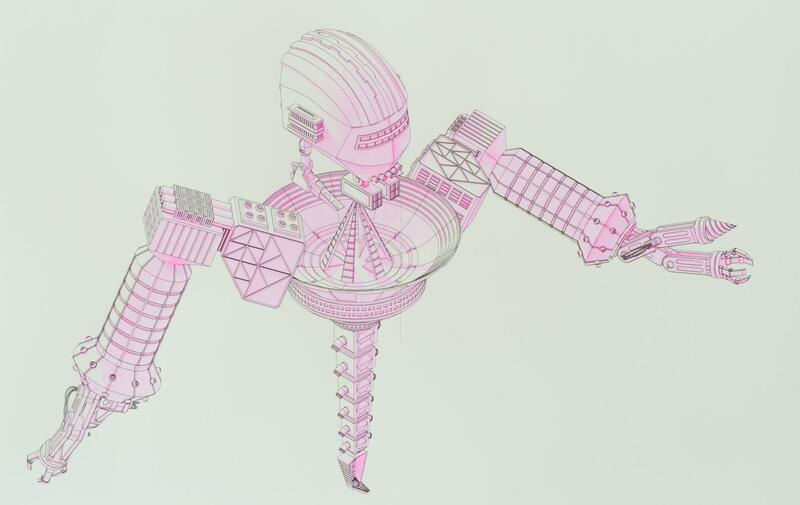 Through video, paintings, schematic diagrams, 3D printed sculpture, and a virtual reality experience, Ganske offers an immersive tour of Centralia Habitat, his concept of a space colony. 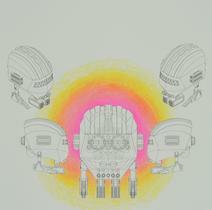 The video and paintings envision a space habitat that reflects Ganske's cautious optmisim. He is excited about the technology of the future, but is prepared for some bumps along the way. 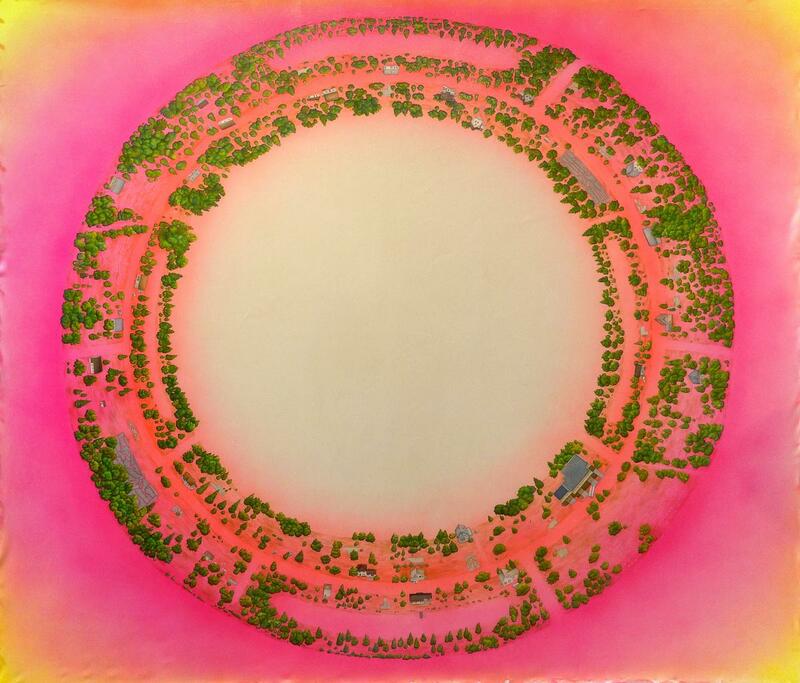 Ganske is informed by the idyllic concept art produced by NASA in the 1970s, but does not adhere to the utopian paradises that depicted technological Arcadias of lush valleys, whitewashed homes, and smiling affluent whites. Instead, he posits a future infrastructure where technology moves through cycles of innovation and obsolescence, and access to technology depends on location and class status—as it does today. He combines fantastical technologies with images drawn from the real life town of Centralia, Pennsylvania, a ghost town that was abandoned in 1962 due to an underground fire that rages to this day. Once a thriving coal mining town, it was felled by the very technology that once supported it. 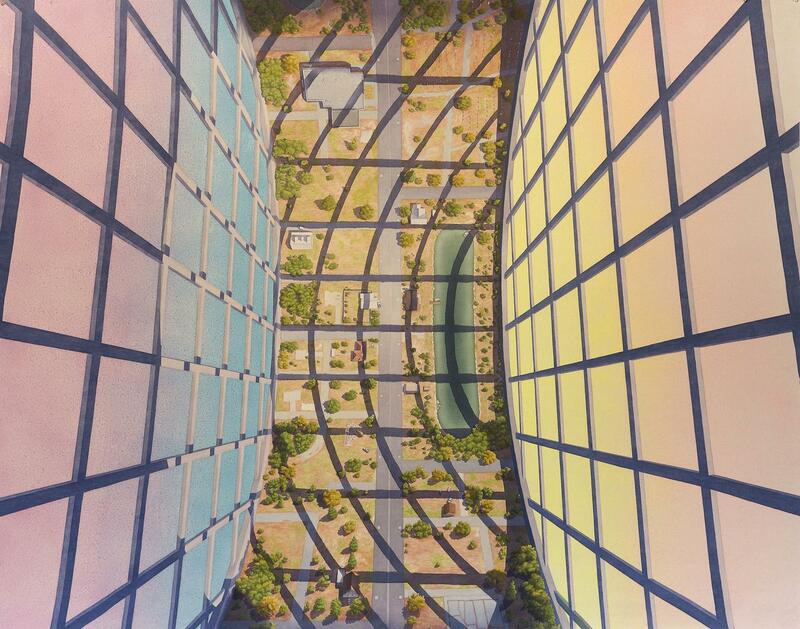 Ganske predicts analogous setbacks within the history of the distant future, that we will always be replacing old technologies with new ones, and that any human habitat ultimately becomes a collage of time periods. 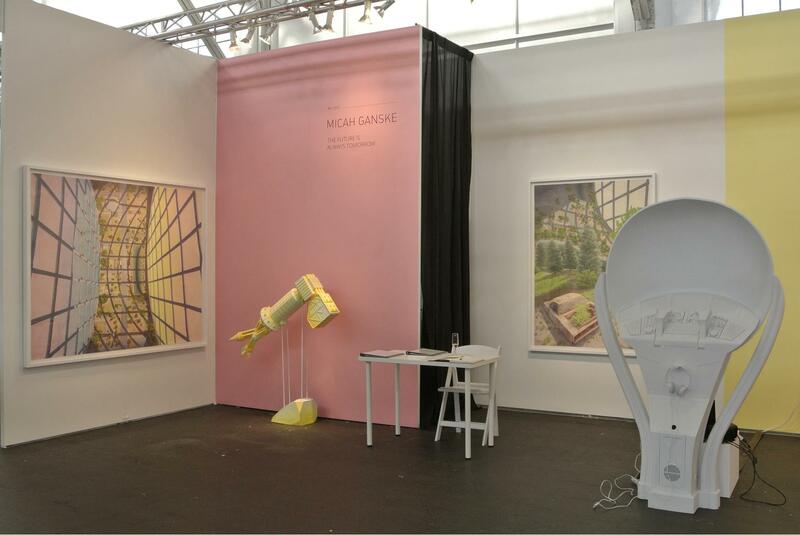 Just as Ganske’s paintings coalesce the realities of the present with future visions, so too do his sculptures and schematic diagrams. These works envision another aspect of humanity’s future: a fleet of spacecraft designed for human exploration of distant worlds. Based on the human form, Ganske designed each sculpture as a specific body part and exploratory function; for example, his “arm sculpture” is a mining vessel equipped with drilling tools and storage space for extraterrestrial ores. 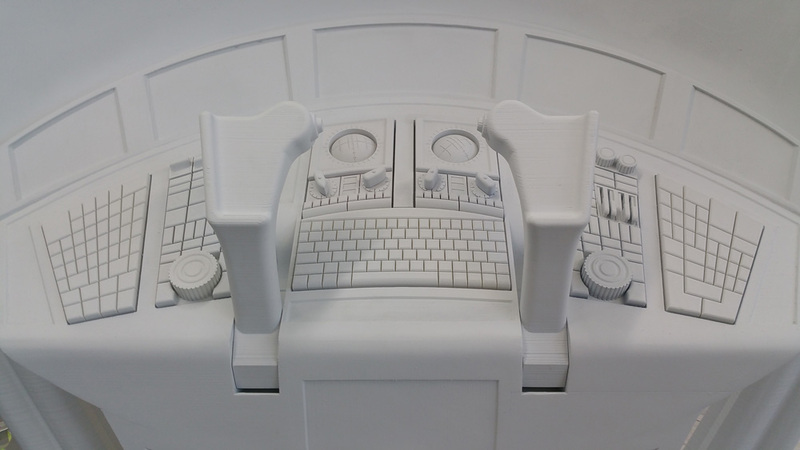 The centerpiece of the booth is a 3D printed sculptural kiosk, remniscent of an old arcade machine updated to reflect the twenty-first century aesthetic: all white with smooth, rounded edges. As the viewer interacts physically with the kiosk, he/she virtually explores a space habitat. In this habitat, the physical sculpture becomes a small spacecraft that transports the viewer throughout the environment.